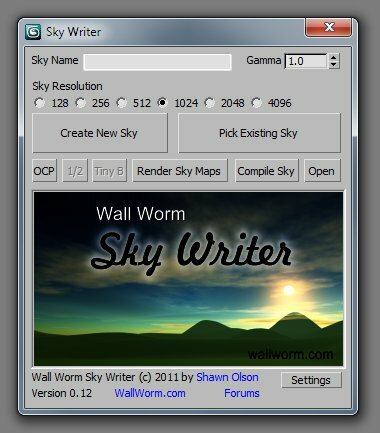 I've got a new tool: Sky Writer... you can now send your 3ds Max scene into Source as a HDR Sky Texture in moments. Looking for feedback on it. There are some docs on the link above... I'll add more next week as well as maybe a video going over the usage. Think we could get some screenshots of this in action? I'd like to see how the rendered images look in comparison to the 3ds max scene it's snapshotted from. I just updated the tool a while ago to version 0.12 so that you can set your preferred gamma for the output bitmaps. Also I just added a video on usage. I haven't made any screen shots yet of the tool in game. I will when I'm done working on a sky that I am making for one of my own maps. As for renderers... this tool lets you use whatever renderer you want. Whichever renderer you have selected it will use that. I have tested it with the Default Scanline Renderer and Mental Ray. I don't have Vray... but can't think of any reason it won't use any renderer you want.